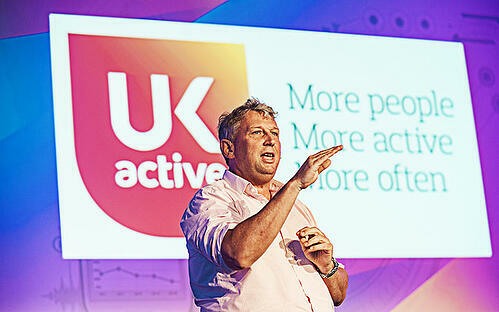 David Stalker is incredibly passionate about the UK Active mission ‘more people, more active, more often’. After seeing him speak at our Wellbeing seminar in July, I wanted to find out more about the part that employers can play in this mission and how our clients can encourage and empower their employees on a practical level. I asked David what he thinks the role of UK employers is in getting employees fitter and how do they start to put these wellbeing initiatives in place? Which is the best way to avoid physical inactivity at work? How can it be measured and are wearables a good idea in the workplace? So many questions! He’s not expecting companies to demand that all of their employees suddenly sign up for a triathlon, but that they work with employees to identify their fitness preferences and enable them to build and improve on what they already do. If they do nothing now, then they should do a little bit tomorrow, and a little bit more the following day. I think this is both realistic and achievable, whatever size business you work for. Employers need to focus on educating employees on how small lifestyle changes can make a big difference and it needs to be because the employer wants to enable the employee to be the best that they can be, not just about increasing productivity. I also really like David’s point about not being afraid to incorporate wearables early on. They allow progress to be measured and they generate more interest than any email or poster can do; some of them are quite interesting and they will also appeal to the more techie employees. We have a group of Jawbone users here at Reward Gateway and they have been known to be a bit competitive at times. Wearables like these bring the wellbeing agenda and the topic of health and fitness into the workplace on a daily basis. I completely agree that we’re a nation of pill takers, David has some strong views on the role that the press and pharmaceutical companies play in encouraging this. Employers should write physical activity into their wellbeing strategy and educate employees on the many, many benefits that it can have, it’s not just about weight loss or fitness, it’s also good for mental wellbeing and a preventative for many illnesses and conditions. Promoting fitness is about more than offering good gym discounts or implementing a Cycle2Work Scheme, I think a really big part of it is helping employees see the value in physical activity and enabling them to easily fit it around their working lives. Simply said, employers must find a way to reduce physical inactivity in the workplace. They should be asking, ‘what can we do to ensure that our employees become more active, more often?’. Is it through a company sports day, a group challenge or flexible working hours to allow people time to go to the gym? You could encourage employees to take the stairs instead of the lift or supply wearables to allow employees to see firsthand how much exercise they actually do. There’s a huge range of options available, whatever your budget and whatever your demographic looks like. I think it’s clear that physical activity deserves to play a big part in any wellbeing strategy. For more ideas and information visit www.ukactive.com.